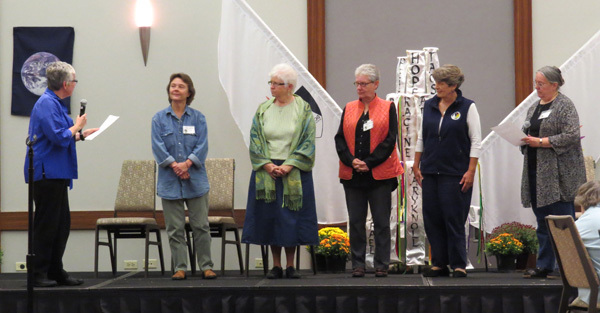 The Dominican Sisters Conference (DSC) held its second convocation at the Westin Hotel in Wheeling, IIllinois, Oct. 1–4. 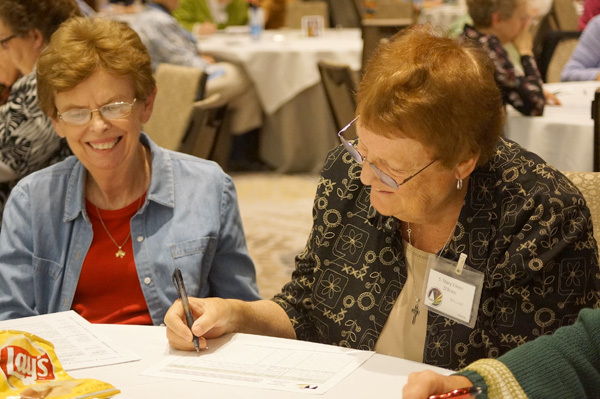 The gathering of more than 400 Dominican sisters and associates from all over the country generated great energy and enthusiasm for the mission of the DSC and for the 17 congregations represented there. The theme of the convocation, “Preaching the Word—The Dominican Imperative—Yesterday, Today, and Tomorrow” was celebrated by exceptional preaching from Patricia Bruno, OP, Maureen Geary, OP, and Elise Garcia, OP. 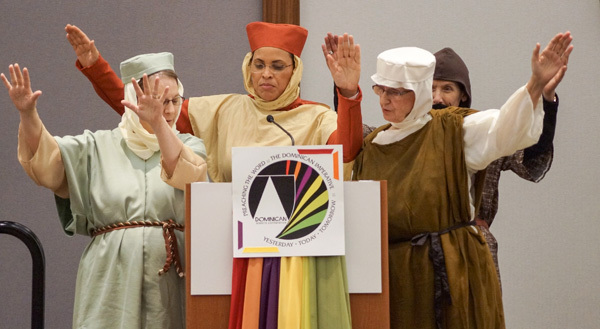 The DSC celebrated 800 years of our charism of preaching by remembering the stories of the first Dominican women who were invited by Dominic in 1206 to be part of the “Holy Preaching” even before the foundation of the Dominican Friars in 1216. All those gathered were happy to welcome our brother James Marchionda, OP, provincial of the Central Province of Friars, as he celebrated Eucharist with us. On Saturday evening, in a stirring ceremony, the sisters and associates signed letters encouraging our civil representatives to support substantive and binding agreements on climate change at the upcoming climate summit in Paris. Those gathered offered these documents to four sisters, Margaret Mayce, OP, Patricia Siemen, OP, Patricia Daly, OP, and Elise Garcia, OP, along with a blessing. The sisters will be going to the Climate Summit in Paris at the end of November and will carry our name with them as part of Civil Society gathered there. The ceremony marked a culmination of a year of study entitled, Paris 2015 and Counting – which is available online. Whenever Dominicans gather, one can expect study, prayer, and preaching. Those are three of our four pillars of Dominican life. And it is the time spent together as community (the fourth pillar) at meals and in conversation that binds us closer together. And so it is that we Dominican women who gathered those days in Wheeling strengthened our relationships in those very things—in celebration—in conversation—in prayer—and in fun. And in this case, fun meant dancing! Rick Storto, brother to one of the sisters, was our disc jockey on Friday evening. What a great selection of music that could satisfy any age. Fortunately he remembered how the sisters enjoy the Electric Slide! It is safe to say that that all who gathered left the convocation on Sunday with the commitment to the preaching imperative for another 800 years! More photos and presentations from the event are posted on the DSC web site.